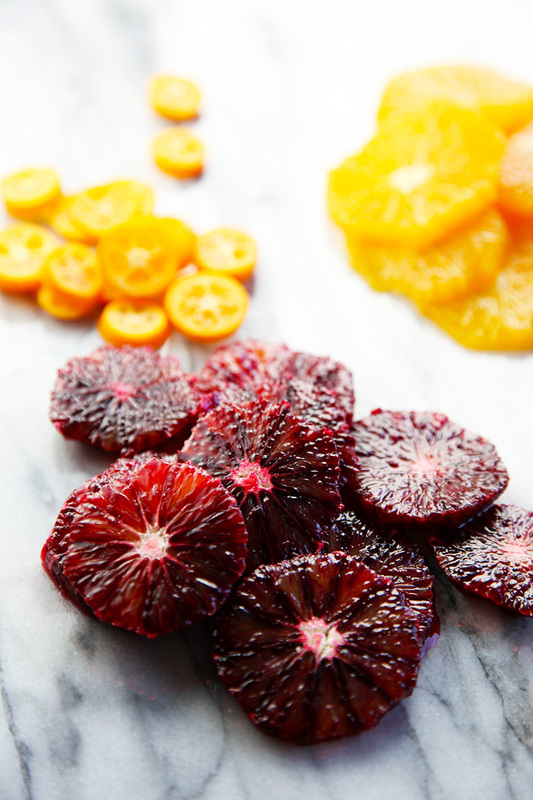 There isn’t a whole lot I like about winter, but juicy blood oranges are one of the few things that I can’t get enough of. 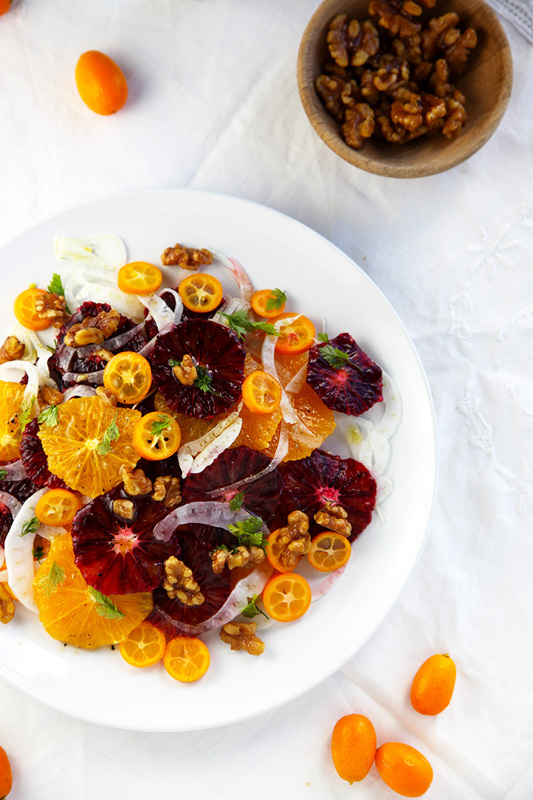 The colours are just gorgeous and I love love love orange salads. There is another one that I make regularly with rosewater, pistachios and goats cheese – but I’ll leave that for another post! 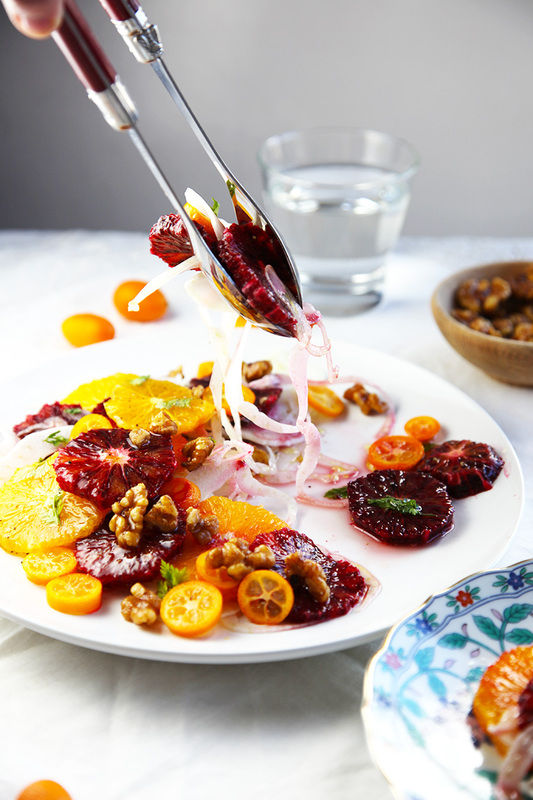 This citrus salad with fennel and walnuts on first glance may not look toddler friendly, but what kid doesn’t like oranges! My little dude also loves fennel. Possibly something to do with the about I ate when breastfeeding in the early days – apparently it helps with milk supply and let down. So I ate a lot of it, and inadvertently, so did H.
The cumquats in the recipe may not be to everyone’s taste, so skip them if you can’t find them or don’t like them. I grew up eating them and love the sourness. My Nanna had a tree that produced the sweetest fruit. I find the sweetness is in the skin and then flesh is quite sour, so its important to eat the entire fruit. If you are worried about giving walnuts and your child, keep them to the side and pop some on your serving only. Cut the top and bottom off the oranges. Run your knife down the sides to remove the remaining skin so there is no white left on the oranges. Slice the oranges. Using a mandolin to slice the fennel as fine as you can. Alternatively use a sharp knife to slice as fine as possible. 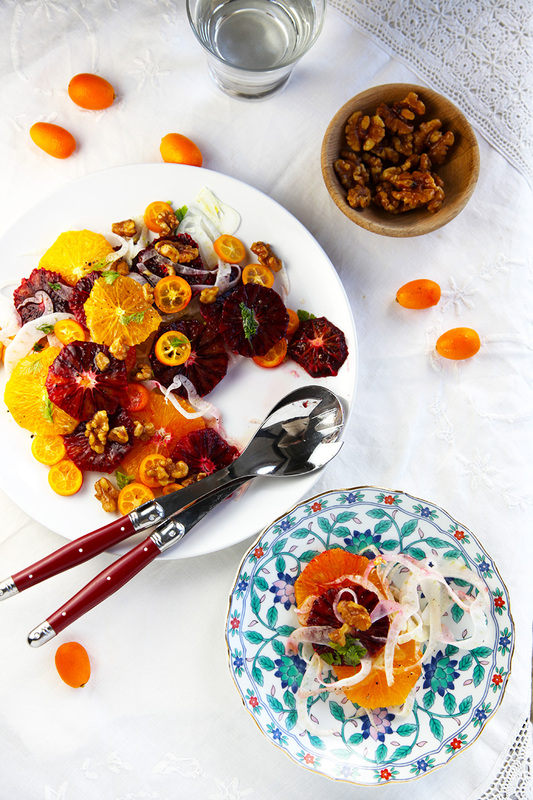 Arrange the fennel on a plate and top with the oranges, cumquats, walnuts, and garnish with the chervil. For the dressing, combine all ingredients in a small bowl and combine. Drizzle over the salad. Serve, or refrigerate until ready to serve. Serves 4 as a side. I prefer it served cold from the fridge, it allows everything to marinate and the fennel under the oranges to take on the other flavours. This looks delicious, and what what beautiful photos! This salad looks gorgeous!! I bet it was delicious! love the dressing! Thanks Neli, It was delicious. I love just about anything with orange blossom water in it! I just made my first recipe using fennel this week. This salad is simply beautiful. Definitely saving to impress at a future dinner party! Great Kari, I used to always roasted fennel but have been putting it in salads for the last few years now. I absolutely love the slight aniseed flavour. Looks amazing! I love salads with nuts! Thanks Tonia, Me too! Nuts and cheese always make salads a winner in my book. Beautiful salad! I would absolutely serve this to my little ones. Important to expose them to more “adult” food. Great to find your blog too — lovely photos! Thanks Sarah, my little guy loved it. I totally agree about exposing them to as many different foods and flavour combinations as possible when they are young. H is nearly 2 and a half and only eats adult food now. I love the color of this salad. Sounds yummy and healthy. Thank you for sharing. Your salad looks so fresh, tasty and delicious and your photography is just beautiful! My mouth is watering! wow the colors are out of this world, pinning it, a salad like this must be shared! Fennel and citrus really are a match made in heaven. I’m absolutely loving your use of cumquats in this! I would never have thought to add them but can just imagine how wonderful they would taste combined with the other citrus. Holy smokes this looks amazing! 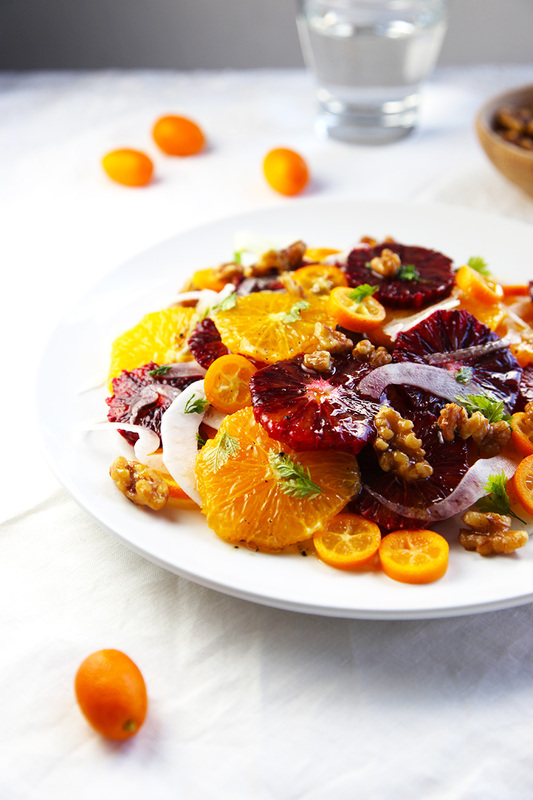 I’m not sure that I’ve ever been so excited about a salad… They’re simple, but oranges are my favorite fruit. And I started experimenting with fennel last winter when I added it to a salad. Can’t wait to try this! Sooooo stunning! I love the rich colors and fennel, so crisp and clean and refreshing!